(L-R) Pete Cacheiro, Roy Romaya, Jenice Condie, Dr. Daniel Lueders, Ken Liesegang, and JoJo Rinebold. 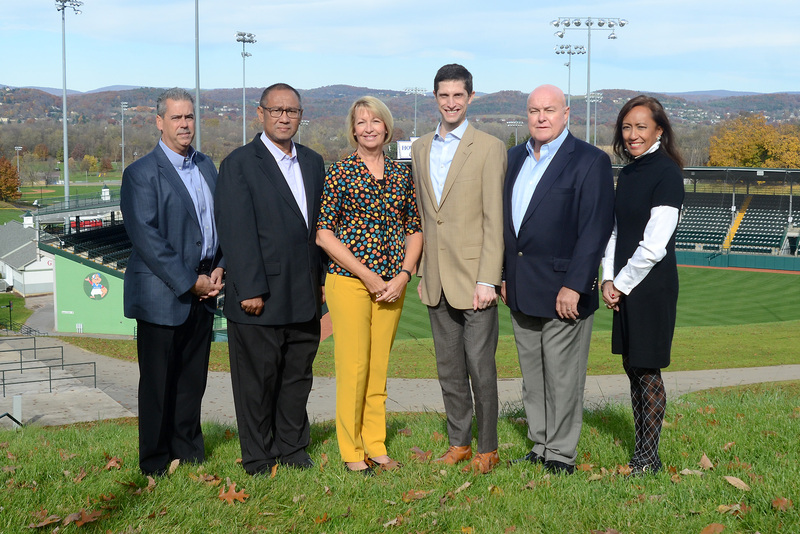 Six dedicated volunteers have officially been elected as the newest members of the Little League® International Board of Directors at their annual meeting on Friday, November 9. The Little League International Board of Directors serve an important role in providing expertise, guidance, and oversight to Little League’s global program and set the direction for the organization’s future. Each of the members of the Little League International Board of Directors are volunteers and receive no compensation for their dedicated work on behalf of the program and the children of the world. Along with more than a dozen at-large members from a variety of occupations and backgrounds, the Little League International Board has nine Field Directors, each representing one of Little League’s nine regions, who are nominated by their peers for election to four-year terms by their region’s District Administrators. Here are the six new members to the Little League International Board of Directors, including three new at-large members as well as the three Field Directors who were nominated for election earlier this year. Growing up as a Little Leaguer in Huntington Park, Calif., Pete Cacheiro currently serves as a Lieutenant for the Los Angeles County Sheriff’s Office and is the Acting Police Chief in La Puente, Calif. In addition to his involvement in law enforcement, Mr. Cacheiro also serves as a Resident Security Agent (RSA) for the Commissioner’s Office at Major League Baseball, was a graduate of the FBI National Academy Session 266, and is a volunteer with Isaiah’s Rock Foundation, the National Latinos Peace Officers Association, AYSO, and the Manny Mota Foundation. Daniel Ryan Lueders, M.D., currently serves as a Sports Medicine Physician and Assistant Professor of Physical Medicine and Rehabilitation at the University of Pittsburgh Medical Center in Pittsburgh, Pa. After completing his residency and fellowship training at the Mayo Clinic in Rochester, Minn., Dr. Lueders served on faculty at the University of Michigan before taking his current position in Pittsburgh. He is a Fellow of the American Academy of Physical Medicine and Rehabilitation and member of the American Medical Society for Sports Medicine. Growing up, Dr. Lueders was a multi-sport athlete, playing baseball, soccer, tennis, and basketball. He currently is an avid road cyclist during his free time. Owner and principal of The Rinebold Company, a female-owned consulting practice based in central Indiana providing communications, marketing, and brand strategy expertise, Mrs. Rinebold has more than 25 years of experience in professional and amateur sports, entertainment, education, and member associations. She is also an adjunct faculty member of the Indiana School of Public and Environmental Affairs (SPEA) Executive Education Program, teaching marketing and communications for non-profits. In addition, Mrs. Rinebold has volunteered with Zionsville Little League for the past nine years in several roles working alongside her husband Michael who served in a number of Board positions including president. With her professional experience, Mrs. Rinebold also produced the opening ceremonies and developed a league brand strategy for Zionsville Little League. In addition to her Little League volunteerism, Mrs. Rinebold has also volunteered with Zionsville Rotary Club, Brebeuf Jesuit High School Mothers Association, St. Monica School Commission, and Kelley School of Business Women’s MBA Alumni Advisory Board and is a Richard G. Lugar Excellence in Public Service Graduate. Mrs. Condie has been involved with Little League for the last 31 years, including 16 years as a District Administrator. Along with her position as a D.A., Mrs. Condie has served as a member of the Little League International Advisory Board and is a current member of the Western Region Advisory Board. In addition, Mrs. Condie has served in a variety of local league roles, including League President, Treasurer, Secretary, Player Agent, and Team Mom Coordinator. Mrs. Condie will be replacing Bob Toigo as the Field Director for the West Region. Mr. Liesegang has been a Little League volunteer for more than 25 years, including nine years as a District Administrator. Along with his experience as a D.A., Mr. Liesegang has served in a variety of capacities within the Little League program, including three years as an Assistant District Administrator, three years as a League President, and one year as a team manager. Mr. Liesegang will be replacing Tony Richardson as the Field Director for the East Region. Currently serving as the District Administrator for Indonesia District 1, Mr. Romaya has been a Little League volunteer for 13 years, including three years as an Assistant District Administrator, three years as a League Official, and one year as a Team Manager. In addition to his work with Little League, Mr. Romaya works as the Head of Youth and Development Programs for the Indonesia Baseball and Softball Federation, has served as a manager for the Indonesia Baseball Team, and has attended the Baseball Seminar for Technical Commission (Hong Kong, 2016) and the BFA B-Class Coach Clinic (Nanjing, China, 2016). Mr. Romaya will be replacing Jolly Gomez as the Field Director for the Asia-Pacific Region.